Hernesaari Heliport (Finnish: Hernesaaren helikopterikenttä, Swedish: Ärtholmens heliport, IATA: HEN, ICAO: EFHE) is located at Hernesaari, in Helsinki, Finland. The heliport is run by Helikopterikeskus. 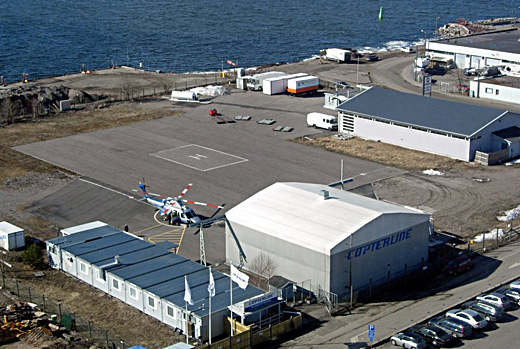 The Heliport is run by Helicopter Center Inc. Helsinki A new user for the Heliport is the FAST CLASS by Copterline service. FAST CLASS by Copterline is a brand owned by the FastClass Corporate Group (previously named Line-Support Group). The service began in September 2011 with regular scheduled flights operated five times a day on the Helsinki-Tallinn route. The service is mainly targeted to the needs of the business traveler with appropriate schedules and service but it will also be useful for leisure travelers. The new FAST CLASS BY Copterline terminal in Hernesaari will offer parking facilities, the FAST CLASS by Copterline Check-in services and a business lounge space, especially catered to meet the needs of the business traveler as well as other passengers. The Hernesaari area is in constant development and a new helipad situated on a land fill area has been planned. The city development board agreed on a draft for the amendment of the town plan in December 2009. As of August 2011, FastClass company plans to restart the operations.